Jinshan Marina is an ambitious large-scale master-planning proposal for Jinshan, a city within Shanghai metropolitan area. 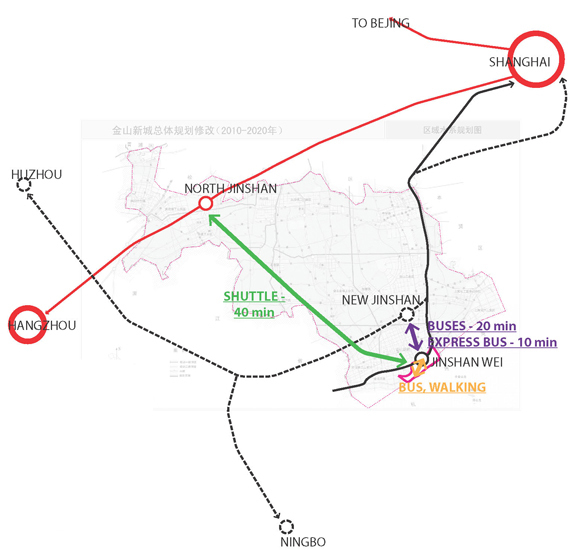 For its size and location, this master plan represents a unique opportunity for Jinshan to become a prime touristic destination in one of the most dense and populated areas of China. Systematica joined Gala during the competition phase as transport designer, with the task of delivering an integrated set of mobility strategies for the whole development of approximately 700 hectares. The touristic dimension of the project required a predominant role for pedestrian areas as well as for soft modes facilities. The delivered strategy took into account all transport modes, including private traffic and public transport. The geographical location of the project, in an area that is highly stressed by the effects of climate change (storms, tides, and heat island), called for an impressive innovative design in managing the waterfront and the proposed land reclamation. Aspects of mitigation (reduction of GHG emissions in the mobility strategy) to any adaptations (careful planning, risk management standards and EWE) have guided the design team in shaping the development of the area. A set of integrated mobility strategies is delivered to supply an area of 700 hectares.